Alice in Wonderland is one of those books that has been adapted many times for film. Paramount released a live action version in 1933 with an incredible cast: Gary Cooper, Cary Grant, Jack Oakie, W.C. Fields, etc. For all the star power, the film is not very good. 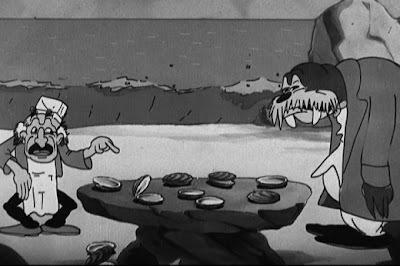 The Walrus and the Carpenter segment in the film is animated, produced by Hugh Harman and Rudy Ising. It's also not particularly good, but it is somewhat rare and the film is going to be on Turner Classic Movies on Friday, May 3 at 8 p.m. Eastern time. The whole film is a curio, but if you haven't seen it, it's worth watching once. Excerpts from Steven Soderbergh's keynote address to the 56th San Francisco International Film Festival. Read the whole thing here. It's long, but worthwhile. "The simplest way that I can describe it is that a movie is something you see, and cinema is something that’s made. It has nothing to do with the captured medium, it doesn’t have anything to do with where the screen is, if it’s in your bedroom, your iPad, it doesn’t even really have to be a movie. It could be a commercial, it could be something on YouTube. Cinema is a specificity of vision. It’s an approach in which everything matters. It’s the polar opposite of generic or arbitrary and the result is as unique as a signature or a fingerprint. It isn’t made by a committee, and it isn’t made by a company, and it isn’t made by the audience. It means that if this filmmaker didn’t do it, it either wouldn’t exist at all, or it wouldn’t exist in anything like this form. "...The idea of cinema as I’m defining it is not on the radar in the studios. This is not a conversation anybody’s having; it’s not a word you would ever want to use in a meeting. Speaking of meetings, the meetings have gotten pretty weird. There are fewer and fewer executives who are in the business because they love movies. There are fewer and fewer executives that know movies. So it can become a very strange situation. I mean, I know how to drive a car, but I wouldn’t presume to sit in a meeting with an engineer and tell him how to build one, and that’s kind of what you feel like when you’re in these meetings. You’ve got people who don’t know movies and don’t watch movies for pleasure deciding what movie you’re going to be allowed to make. That’s one reason studio movies aren’t better than they are, and that’s one reason that cinema, as I’m defining it, is shrinking. "...And unfortunately the most profitable movies for the studios are going to be the big movies, the home runs. They don’t look at the singles or the doubles as being worth the money or the man hours. Psychologically, it’s more comforting to spend $60 million promoting a movie that costs 100, than it does to spend $60 million for a movie that costs 10. I know what you’re thinking: If it costs 10 you’re going to be in profit sooner. Maybe not. Here’s why: OK. $10 million movie, 60 million to promote it, that’s 70, so you’ve got to gross 140 to get out. Now you’ve got $100 million movie, you’re going spend 60 to promote it. You’ve got to get 320 to get out. How many $10 million movies make 140 million dollars? Not many. How many $100 million movies make 320? A pretty good number, and there’s this sort of domino effect that happens too. Bigger home video sales, bigger TV sales, so you can see the forces that are sort of draining in one direction in the business. "...In 2003, 455 films were released. 275 of those were independent, 180 were studio films. Last year 677 films were released. So you’re not imagining things, there are a lot of movies that open every weekend. 549 of those were independent, 128 were studio films. So, a 100% increase in independent films, and a 28% drop in studio films, and yet, ten years ago: Studio market share 69%, last year 76%. You’ve got fewer studio movies now taking up a bigger piece of the pie and you’ve got twice as many independent films scrambling for a smaller piece of the pie. That’s hard. That’s really hard." I finally caught up with this film on DVD and I'd say it's a mixed bag. The best thing about it is the design, which seems influenced by Lorenzo Mattotti. It's a relief to see a drawn feature that isn't imitating a too-familiar animation style. The next best thing is the direction, which is taut. The suspense works well and the chase scenes are exciting. The story, however, is typical of a TV cop show. It's literally cops and robbers stuff. The only ambiguity is the cat burglar, whose personality is never developed well enough to explain why he's stealing in the first place or why a child's welfare is enough to cause him to change his plans. The real villain, Costa, is pure cardboard. He's exactly the kind of villain that animation too often falls back on: someone who is nasty with no explanation and surrounds himself with incompetent, comedy-relief henchmen. The woman police officer is the only character who is really motivated. Besides needing to catch criminals for her job, she has a personal stake in catching Costa, who murdered her husband. If all the characters had been developed to the same level, the film would be more interesting. The graphics, direction and pacing certainly make watching it a pleasant experience and Europe continues to show that drawn animation has possibilities that North America has ignored. But the film itself doesn't live up to its design. This is the directors' first feature. Jean-Loup Felicioli and Alain Gagnol are currently working on Phantom Boy, due for release in 2015. 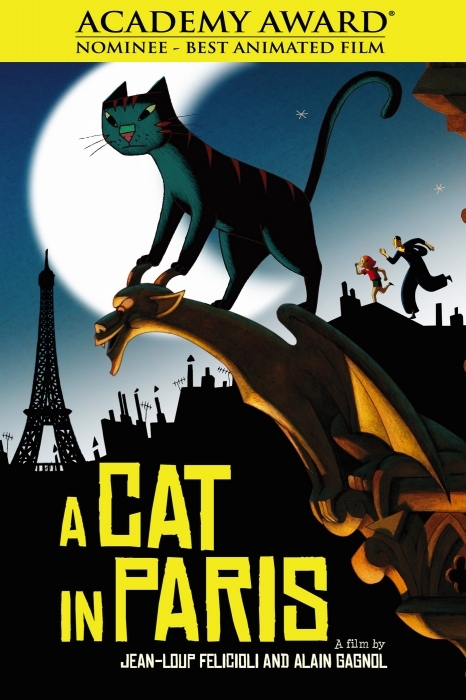 While the story is another cops and robbers tale, there's enough promise in A Cat in Paris that I'm looking forward to it. 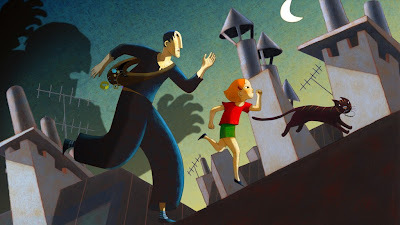 As a sort of follow-up to my last post, I'd like to point you to an excellent piece by animation veteran Steve Moore over at the FLIP blog. It's a great look at studio politics in the present day and a warning about the rose-coloured glasses that animation artists often wear. I'd point out, especially to students about to enter the workforce, that the large studios many students aspire to are often the most political. They are filled with excellent artists and those artists are also highly ambitious. It's the combination of those two qualities that got them there. That causes the political maneuvering for choice spots, whether it's job titles or the juiciest shots, to be extreme. Smaller studios are generally lower pressure places. As an individual represents a greater portion of a studio's workforce, it means that individuals are treated better. Should someone leave, there's a larger hole in the project. Smaller studios are also places where you can make mistakes without the spotlight being on you. Smaller studios tend to work with smaller budgets and have smaller audiences, so the inevitable mistakes early in a career don't attract as much attention. The "Frank and Ollie trajectory," as Moore describes it, was always a rare occurrence. It's good to remember that as much pride as you might take from your employer's name, it's most likely a temporary association. And just so you don't think that Moore's opinion is the exception, read what Steve Hulett of The Animation Guild has to add. In the last several months, there have been major layoffs at visual effects, gaming and animation companies. They don't want you. They want your skills because they can profit from them. But if they can get your skills from software or find somebody with your skills (or almost your skills) who will work cheaper, they'd prefer that. When the project is finished and they're done with your skills, you're expendable. If the projects they pick lose money, you pay by losing your job. If they can find a government stupid enough to use taxpayers' money to subsidize them (when they are already profitable), they'll relocate. If they need to buy skills from another company, they'll do it as cheaply as they can, even if it means they put the company out of business. And if they see other skills that will make them more money than yours, they no longer want your skills. Any why? Because they have money and that makes them think they are smart. But they're not as smart as they think. And they know (and they're right) that money attracts skills like a magnet, so as long as they have money, they don't have to worry about finding skills. Their money comes from the audience: you and me. So long as we give them money, they won't change. As long as the skills chase the money, nothing will change. But if the skills can get their money from the audience, everything will change. 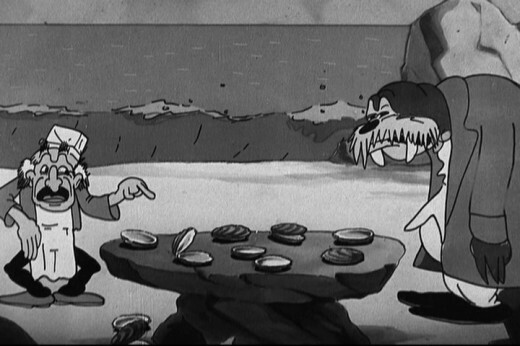 There's no question that Cartoon Brew is one of the most widely read animation sites on the web. 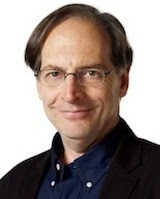 When its authors Amid Amidi and Jerry Beck decided to split, leaving Amid in charge of Cartoon Brew, there was a question of where Jerry Beck would turn up next. He first revamped his Cartoon Research site. Jerry's love for animation history is well known and he has additional authors such as Jim Korkis and Fred Patten contributing to that site. But Jerry has never been stuck in the past and now he's launched Animation Scoop, a site for news and discussion of contemporary animation. So where I once checked out Cartoon Brew regularly, I now have three sites to check. As Amid and Jerry are both hosting guest contributors, the animation blogosphere is now richer than ever for news and opinion. I wish everyone continued success.